It also offered a sneak peek at its square lighting display. A few months ago, Nanoleaf revealed a "Rhythm Starter Kit" that let you synchronize its colorful Aurora light panels with music. At CES, the company released a product designed to control it and more: the Nanoleaf Remote. But unlike a typical handheld remote control, the Nanoleaf Remote is in the shape of a 12-sided polygon -- a dodecahedron, if you will -- which changes the lights depending on which side it's on. And the beauty of it is that you don't have to use it with just Nanoleaf products -- it'll work with compatible Apple HomeKit products as well. So, for example, you could turn one of the sides to adjust the temperature, or you could flip it to another to lift your blinds. Or, if you like, you can map one of the sides to a particular "scene" that will do things like turn on your lights and play a favorite song at the same time. And, of course, all of the functions can be designated and assigned using the Nanoleaf companion app. I checked out the Nanoleaf Remote at the company's booth at CES and was enamored by its ease of use. Admittedly, I was also very amused by its die-like shape, and I asked a spokesman if you could roll the Remote like you would a pair of dice. He said yes, you could, but he did warn that there's a chance it could break if you did it that way. At the same time, he said it was made out of a durable plastic, so you could try it out at your own risk. Changing lights is really as easy as shifting the dodecahedron from side to side. Each side lights up in a different color after it's faceup, as a visual cue that an action has been triggered. In our demo, all the Remote did was change the Nanoleaf light panels from one color palette to another, but it did so pretty easily and quickly. And the Remote wasn't the only thing on display at Nanoleaf's booth. It also gave a preview of an upcoming product: its new square light panels. As with the triangular panels, they can be customized with other Homekit products. The cool part, though, is that while you can connect only up to 30 triangular panels together, you could potentially connect up to 1,000 of these square panels to create a truly immersive experience. What's more, the square displays are designed to be water-resistant, and you can touch and glide your hand around on them to change their colors. The reason for the waterproofing? 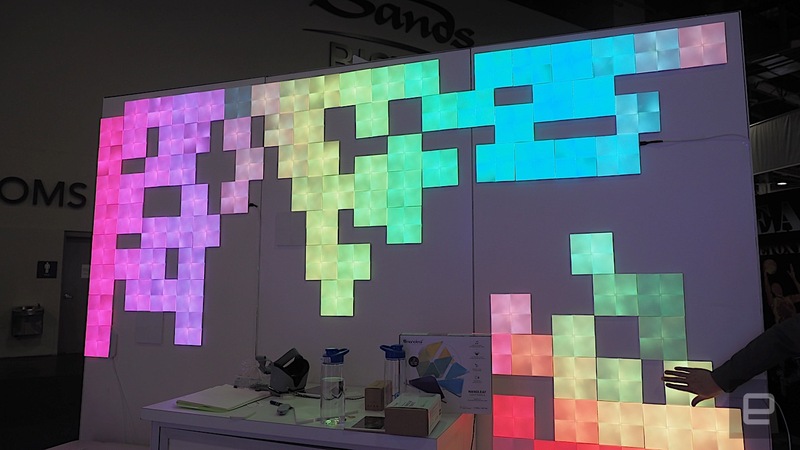 According to a spokesperson, Nanoleaf envisions that these square displays could eventually be installed as a high-end backsplash in a kitchen, or perhaps even a bathroom. That sounds pretty crazy to me, but it would make for quite a conversation starter at your next dinner party. The Nanoleaf Remote will go on sale later this spring for $50, while the availability and pricing of the square displays are still to be determined. UPDATE: A Nanoleaf spokesperson has informed us that the company is still working on the square lighting panels and can't guarantee that the final product will be water-resistant. There's still a chance they could be, but it's not a sure thing at this point.